A new study of Pleistocene megafauna extinctions published in the latest issue of Science received considerable publicity. Most of the media outlets misrepresented the study’s conclusions. Perhaps journalists were confused by the title of the article: “Abrupt Warming Events Drove Late Pleistocene Holarctic Turnover.” The overwhelming majority of media outlets reported that the study suggests climate, not overhunting by man caused the late Pleistocene megafauna extinctions. None of these journalists must have read the abstract because the last sentence of it concedes that man played an important role in megafauna extinctions. The following passage is the last sentence of the abstract (capital letters mine). This means the authors of this study believe rapid climate change reduced and scattered megafaunal populations, making them more vulnerable to human hunting. They make it clear that humans were ultimately responsible for the megafauna extinctions in the last 2 sentences of the main body of this study. The authors of this study collected no original data. Instead, they analyzed data already available from previous studies. They plotted climate data from Greenland Ice Cores with studies of megafauna DNA that determined changes over time in population structures. (Scientists can determine past average annual temperatures by analyzing oxygen isotope ratios in Greenland ice cores that go back 100,000 years. These ice cores have annual rings from summer glacial melt.) The scientists used genetic data from 31 species, including 2 from North America (mastodon and elk), 3 from Beringia, and 26 from Eurasia. They found a close correlation between sudden warming pulses, known as Dansgaard-Oeschger Events, and reduced populations and local extinctions of megafauna. Dansgaard-Oeschger Events precipitated interstadials (warm climatic phases) within the Ice Age that lasted for 1-3 thousand years. In some regions some species of megafauna became locally extinct. Later, when the climate returned to a cooler more arid stage, different clades of the same species recolonized these regions from relic refugia where they found suitable habitat during the interstadial. Chart showing Greenland Ice Core data. This data shows past average annual temperature fluctuations. The arrows point to Dansgaard-Oeschger Events–abrupt warming events that caused brief interstadials during the Ice Age. Prior to the appearance of Homo sapiens in Europe, these interstadials were not associated with local extirpations of megafauna species. But after modern man colonized Eurasia, various species of megafauna did suffer local extinctions following Dansgaard-Oeschger events. Sudden climate change made these species more vulnerable to human overhunting, according to the study linked below. Populations of megafauna remained stable during stadials, the cold phases of the Ice Ages, because the environments they lived in were static. Stadials were longer lasting than interstadials, and open grassy plains prevailed for millennia. The megafauna became adapted to living in these environments. But rapid warming with increased precipitation caused dramatic changes to the environment. Unproductive spruce forests started expanding, and this fragmented and reduced grassland habitat, forcing megafauna to migrate longer distances for suitable pasturage. They followed the same routes between pastures, making them easier for humans to ambush. I have a couple quibbles with this study. First, I think this study is not applicable to North America. The overwhelming majority of genetic data is from Eurasian populations of megafauna. Just 2 North American species were used–a database that is far too small upon which to base any conclusions. Moreover, I hypothesize mastodon populations likely increased during interstadials because they were a semi-aquatic species that favored wetland habitat. Warm wet interstadials caused wetlands to expand. The scientists involved in this study used genetic data from just a single population of mastodons. I’m extremely skeptical that mastodons declined in abundance when wetland habitat expanded. Second, the authors note woolly mammoths survived later in Eurasia than in North America, despite having a longer exposure to human hunting there. I assume they were making the point that climate played a greater role than human hunting in regulating megafauna populations. Indeed, a radio-carbon date of 9760 BP from a woolly mammoth rib found in northern Russia is more recent than a 10,800 BP date from the latest mammoth specimen from continental North America. However, the latter very likely does not represent the last mammoth that ever lived in North America, and sedaDNA from Alaska permafrost suggests mammoths still lived in Alaska 9000 calendar years ago. Mammoths may have lasted longer in North America–there just isn’t enough data to know for sure. It’s unlikely that the absolute last mammoth was preserved. Moreover, northern Russia was probably uninhabited or more sparsely inhabited than most of North America during the late Pleistocene, rendering the author’s point moot. 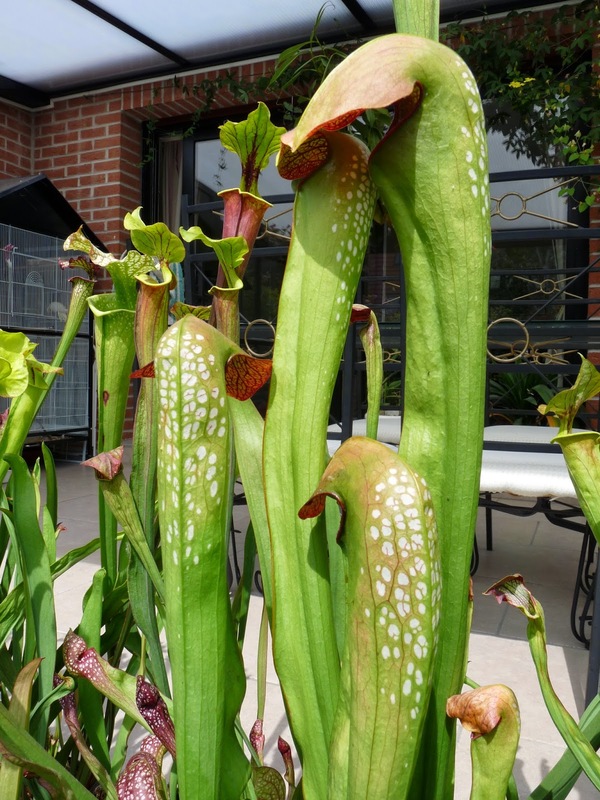 North American pitcher plants belong to the sarracenia genus. A study of sarracenia genetics determined the 11 species in this genus diverged about 4 million years ago. This is when Ice Ages began occurring. Pitcher plants grow in wetlands and moist meadows where the ground is saturated. 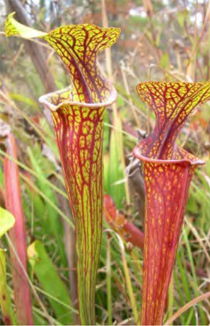 These acidic soils contain low levels of nutrients, so pitcher plants obtain additional nutrition by trapping insects in their modified leaves. Other plants outcompete them on drier richer soils. Glacial expansion caused environmental change in southeastern North America. Dry oak scrub and prairie replaced wetlands and moist meadows and became the prevailing type of environment in this region. Ice Age pitcher plants grew in relic marshes that managed to remain wet because of local conditions. Pitcher plant populations became isolated from each other for long enough to evolve into different species. A yellow pitcher plant (Sarracenia flava variation ornate). The hood keeps the pitcher from overfilling with rainwater. The Okefenokee variety of the hooded pitcher plant. There are 2 varieties of hooded pitcher plant. The Okefenokee variety is tall and catches flying insects. The other variety is short and more likely to trap ants. I studied the range maps of all 11 species of pitcher plants. It appears as if there were 3 main refuges for pitcher plants during Ice Ages (assuming modern ranges reflect the locations of Ice Age refuges). Hooded pitcher plants (Sarracenia minor) survived in some relic habitats on the Atlantic coastal plain. Purple pitcher plants (S. purpurea) survived in relic Atlantic coastal plain and Gulf Coast habitats. The pale pitcher plant (S. alata) and the white-topped pitcher plant (S. leucophylla) survived on relic habitat near the Gulf Coast. The parrot pitcher plant (S. psitticina) and the yellow pitcher plant (S. flava) survived in the Atlantic coastal plain relic habitat and spread west following the end of the Ice Age or they survived in Gulf Coast relic habitat and spread east following the end of the Ice Age. I can’t determine which scenario it was by just looking at range maps. The green pitcher plant (S. oreophila) and the Alabama pitcher plant (S. alabamensis) survived in relic bogs located in the southern Appalachians. Range map for hooded pitcher plant. During the Ice Age they must have survived on relic habitat located on the Atlantic coastal plain. Pale pitcher plant range map. They became reproductively isolated from hooded pitcher plants when Ice Age aridity dried up wetlands between ancestral populations. 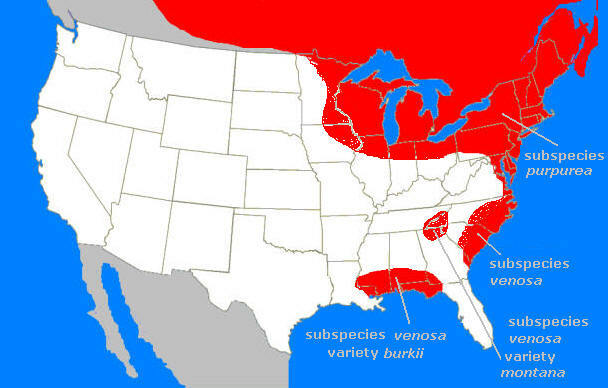 Range map for white-topped pitcher plant–another species that survived near the Gulf Coast during Ice Ages. Range map for Sarracenia purpurea, the only species of pitcher plant that colonized formerly glaciated regions. There are several subspecies. 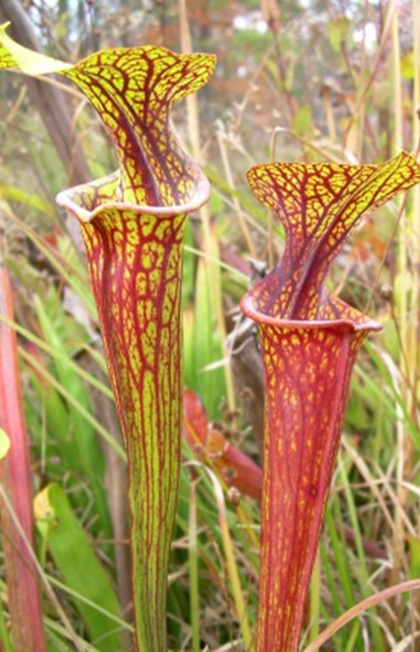 Pitcher plants originated in South America at least 50 million years ago and eventually split into 3 genera. There are 18 species of pitcher plants in the South American heliophora genus. Pitcher plants invaded North America from South America by island hopping across the Caribbean. During the Eocene there was a chain of islands between the 2 continents. Pitcher plant seeds float, allowing them to spread via water. Eventually, these islands were inundated, and the foundling North American population became isolated. Pitcher plants expanded their range across North America in the tropical wet climate of the Oligocene. North American pitcher plants diverged into 2 genera by the Miocene, about 25 million years ago. One species in the darlingtonia genus occurs in northern California and southern Oregon where it grows on serpentine seeps and in interdunal wetlands. The other genera–sarracenia–thrives in the southeast with the exception of S. purpurea which ranges into Canada, the northeast, and the southeast. Pitcher plants are an evolutionary marvel. They’ve evolved a nectar that attracts insects, and a slippery leaf pit that traps the luckless arthropods. Bacterial action in rainwater collected in the pit helps digest the protein. All these plants needed to evolve these adaptations was time and chance. North America suffered a devastating loss of vertebrate diversity about 10,000 years ago when men overhunted the most impressive species on the continent to extinction. So it’s ironic that man is now the agent adding species to North America’s fauna by transporting them from other continents. The new arrivals that survive are often the species most difficult for man to eradicate, unlike the maladapted Pleistocene megafauna. Silly alarmists refer to these species as invasive (as if man himself was not invasive and belongs everywhere). Most are beneficial additions that increase diversity to an environment left impoverished by the end Pleistocene extinction and the activities of industrial age man. I’m rooting for the “invaders” and against wildlife officials attempting exterminate the newcomers. The walking catfish (Claria batrachus) is an amazing import from Indonesia. It has been slithering around Florida since the 1960s, and fishermen have begun catching them in the Flint River, Georgia. 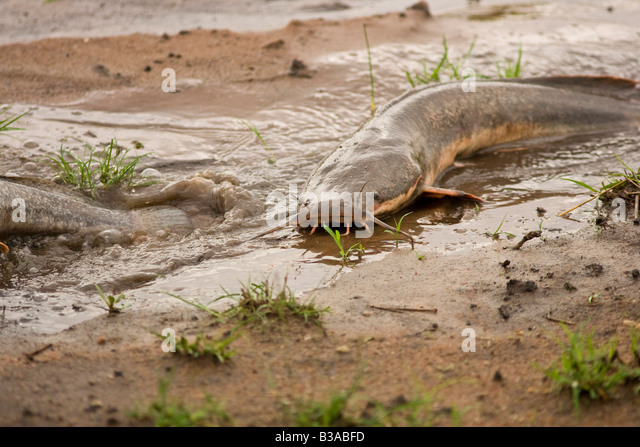 It lives in mud puddles, flooded roadside ditches, and other ephemeral bodies of water; and accordingly does not compete with native fishes. Studies show it takes fewer tadpoles than native mosquito fish and does not pose an undue threat to amphibians. They have the ability to wriggle across the ground and seek bodies of water when their puddle dries up, making them well adapted to Florida’s fluctuating water levels. The walking catfish is well adapted to environments with fluctuating water levels. The Nile tilapia (Oreochronis niloticus) is a native of Africa. They’ve lived in the lower Chattahoochee River, Lake Seminole, and the Apalachicola River since 1991. Though they inhabit shallow water, studies show they don’t compete with native fish in the wild. Tilapia is by far the best tasting and most reliable fish sold in the supermarket. Wild tilapia has dark meat. 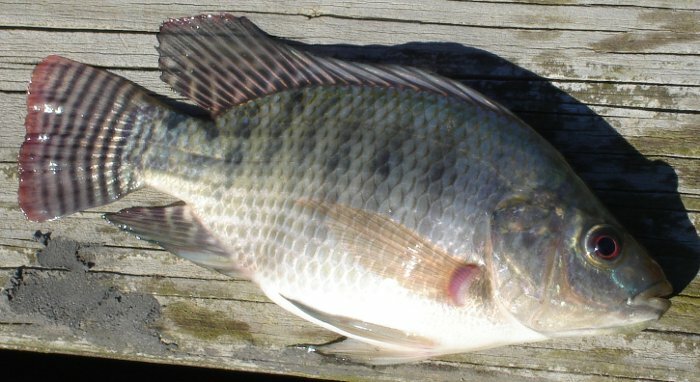 Farmed tilapia have been bred to have white meat because it is visibly more appealing. Nile tilapia. Disjunct populations of this species live throughout the southeast. This is by far the best tasting and most reliable fish in the supermarket. 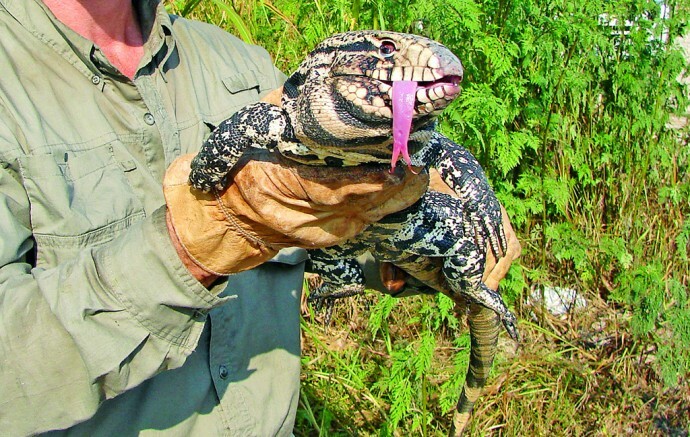 The black and white tegu (Salvator merianae) is a South American lizard that can grow up to 4 feet long. This recent escapee has established scattered populations from north Florida to Miami. They eat alligator and turtle eggs. There is an overpopulation of alligators and turtles in Florida, so wildlife managers should be thrilled. Instead, they want to eradicate them. Black bears were abundant in Florida until late in the 19th century and were formerly a major consumer of alligator and turtle eggs. Tegus are merely occupying a niche left vacant by the extirpation of black bears. Along with Nile monitor lizards, another recent colonizer of Florida’s wilds, they are providing a much needed predator in the local ecosystem. Black and white tegus. These beneficial predators could help reduce the overpopulation of alligators and turtles in Florida. The Florida Wildlife Commission asks people to report where these lizards are. Do not report sightings. Those redneck assholes at the FWC will just come out and kill them. The spectacled caiman (Caiman crocodilus) is a South American crocodilian that’s been living in southeast Florida since the 1960s. They are intolerant of cold and can’t expand their range north. They’re smaller than alligators had have been unable to displace them. Spectacled caimans now live in southeast Florida. Cool! The monk parakeet (Miopsitta monachus) is another native of South America. This colorful bird has established colonies in New York City, Chicago, Miami, and parks in other cities. They build huge stick nests that are used by many other species of birds. Park officials like them because they drive away city pigeons. Pigeon dung is difficult and costly to remove from statues. The monk parakeet is an obvious aesthetic replacement for the extinct Carolina parakeet. 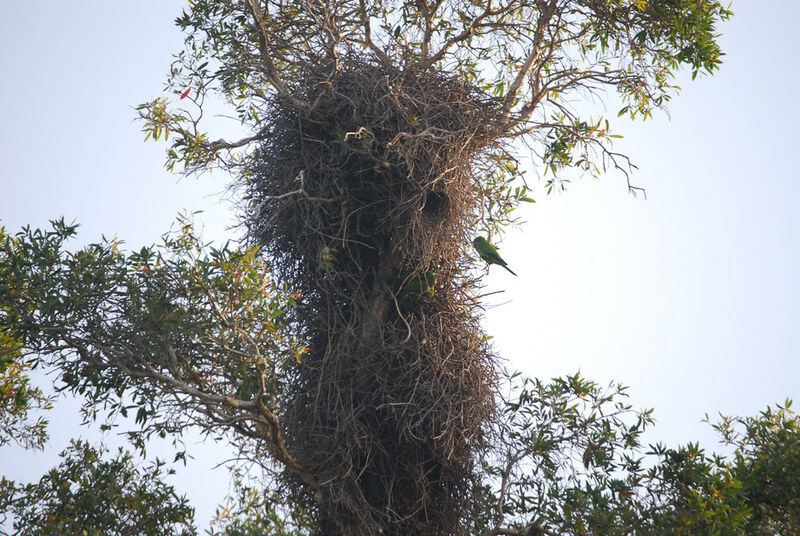 Monk parakeet nest in Miami, Florida. They also live as far north as Chicago and New York City. Other species of birds use their nests. Monk parakeets drive away city pigeons. Fallow deer (Dama dama) are native to Eurasia. Hunters introduced them to south Georgia early in the 20th century. This deer varies in color from brownish-red with spots to pure white. The white individuals are not albino. 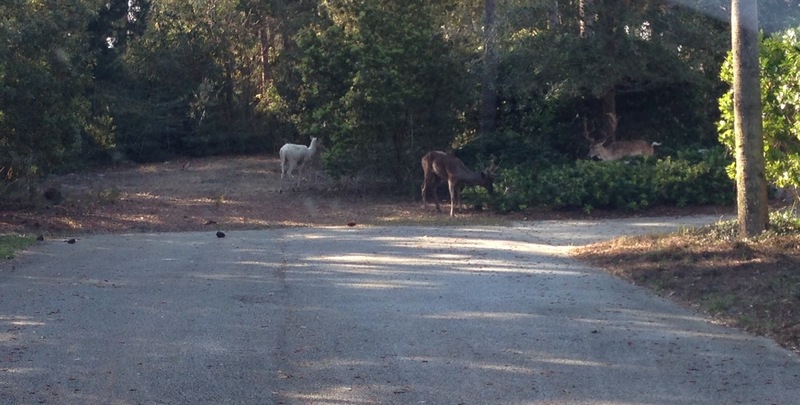 They’re raised on ranches and some have escaped, and wild herds live on St. Simon’s Island, Georgia. Fallow deer on St. Simon’s Island, Georgia. The white variety is common. Two-hundred ring-tailed lemurs (Lemur catta), a native of Madagascar, roam St. Catherine’s Island, Georgia. The island serves as an emergency refuge in case they ever become extinct in their native land. Wildlife officials supplement their diet because the island might not provide enough natural foods. This is not a problem for the 3 non-native species of primate that have successfully established breeding populations in Florida–rhesus macaques, vervet monkeys, and spider monkeys. Ring-tailed lemurs at the North Georgia Zoo. A semi-wild population of 200 lives on St. Catherine’s Island, Georgia. 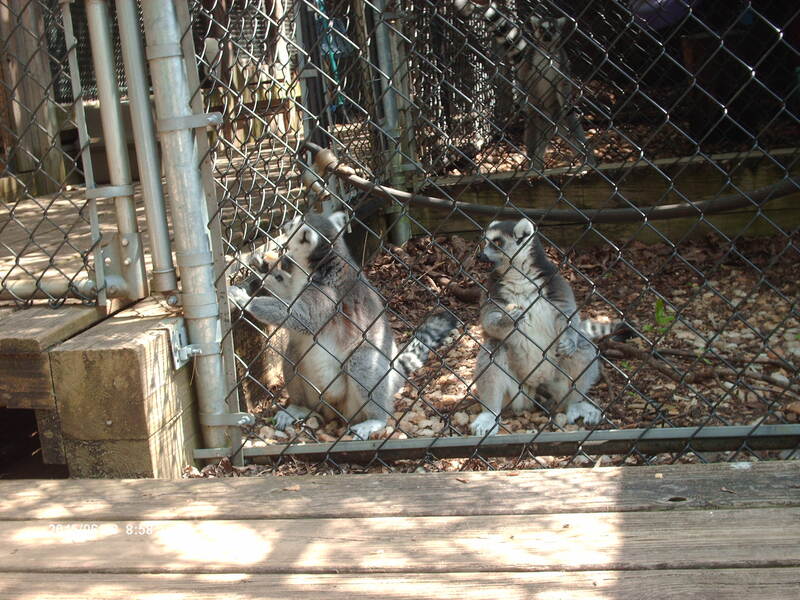 They’re kept there in case the population on Madagascar becomes extinct. Rain water began eroding a limestone outcrop located in what today is northwestern Alabama over 228,000 years ago. The slightly acidic rain dissolved the rock in all directions creating what is known as a phreatic cave system. Crevices provided shelter for small animals including wood rats, squirrels, rabbits, shrews, spotted skunks, bats, lizards, and snakes. Scientists have yet to describe the remains of these smaller creatures in the scientific literature, demonstrating that the amount of fossil material available for study exceeds the time qualified scientists have to study it. About 172,000 years ago rain water began channeling through 1 stream in the cave, creating a rectangular trench. This is known as a vadose cave because it has a dome shaped ceiling with a rectangular floor. A cave entrance enlarged allowing big mammals such as Jefferson’s ground sloth, beautiful armadillo, white tail deer, long-nosed peccary, tapir, giant beaver, bobcat, wolf, and sabertooth inside. This composition of species suggests a wooded environment prevailed locally. The abundant speloethems (cave formation mineral deposits) and their positions gave scientists the opportunity to date the fossil remains, or rather to bracket the age range within which these vertebrates lived. The bone-bearing sediments were found underneath and between calcium carbonate flowstone that could be dated using uranium-thorium dating. (Coral can also be dated using this method.) Uranium 234 decays to thorium 230 at a known rate and by measuring the amount of each and by plugging the values into a mathematical formula, scientists can determine the age. Uranium-thorium dating can date objects up to 500,000 years old, far exceeding the 50,000 year limit of radio-carbon dating. Uranium-lead dating can be used to estimate the age of an object that is billions of years old. Cave ACb-3 accumulated vertebrate remains between ~228,000 BP-~121,000 BP, roughly coinciding with the Illinois Ice Age and the Sangamonian Interglacial. After this, the cave entrance became sealed until recently. 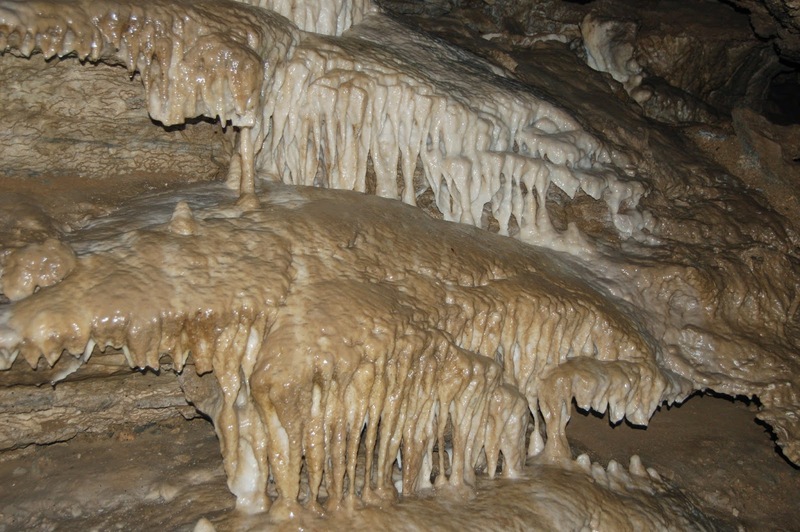 Calcium carbonate flowstone in a cave. Types of cave formations. They can be dated using Uranium-Thorium series dating. A few years ago, Sharon Holte studied the 7 skeletons of Jefferson’s ground sloth that were found in this cave, and she wrote about her findings in her Masters Thesis. She found injuries on the shoulder blades and arm bones that suggested intraspecific fighting. The males likely sparred over mating rights. Ground sloths had powerful arms and huge claws and could have easily killed an unarmed man with raking paw blows. However, ground sloths had thick fur and armor, enabling them to endure intraspecific battles most of the time. Sharon Holte also speculates body change occurred over time within the population of Jefferson’s ground sloths. They evolved from stout and robust during cooler climate phases to longer and thinner during warmer climate phases. I think the sample size from this cave is too small to come to any conclusion about evolving body shape. 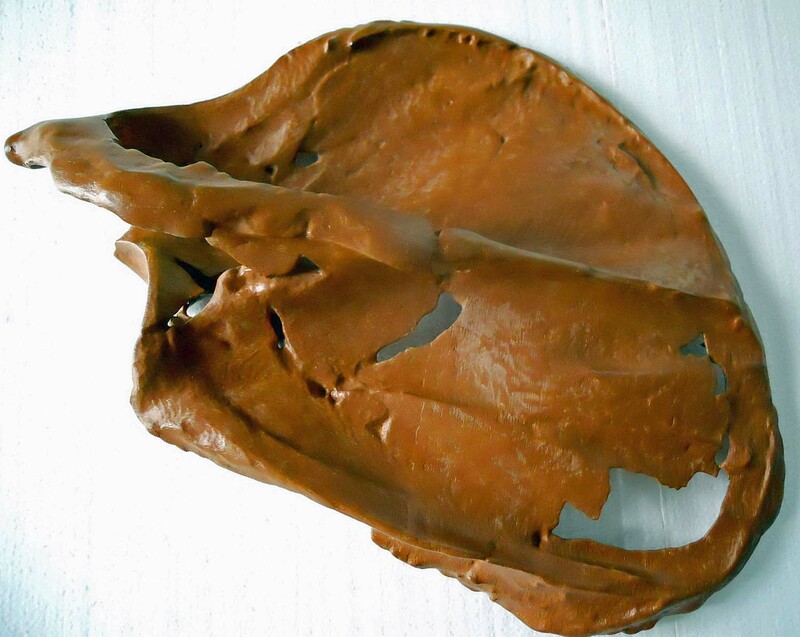 Ground sloth shoulder blade from specimen found in Iowa. Shoulder blade and arm bones of Jefferson’s ground sloths found in Cave ACb-3 show evidence of intraspecific fighting. 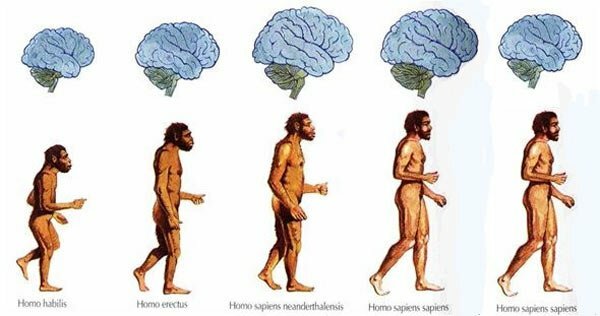 Humans (Homo sapiens), like all other organisms, are continuously evolving, and the forces that shape human evolution have also changed. Before the development of agriculture, ecological pressures were the primary influence on human evolution. Human populations were scattered and low. Each individual had to work and think harder then because survival in primitive environments required greater endurance and intelligence. Pleistocene Homo sapiens had to do it all. On average Cro-magnon man, also known as European early modern humans, had larger jaws and teeth, a bigger lung capacity, and a larger cranial capacity than present day man. The average cranial capacity of a human being living 20,000 years ago was 1500 cubic centimeters compared to 1350 cubic centimeters for an average human today. This larger brain capacity does mean they were more intelligent, but of course lacked our present day knowledge. During the agricultural revolution social competition replaced ecological processes as the primary influence on human evolution. This led to a division of labor, reducing the need for such a large cranial capacity. Human intelligence has declined all over the world since. Modern humans have a smaller brain capacity than their recent ancestors. Incidentally, this illustration is misleading. Homo sapiens did not evolve from Neanderthals. Instead, Homo sapiens and Homo neandethalis shared a common ancestor–Homo heidelbergensis. Homo Neanderthals were also a distinct species, not a subspecies. Domesticated cattle, sheep, goats, and dogs also have smaller cranial capacities than their wild ancestors. Humans culled the larger, wilder individuals; creating tamer breeds. Humans culled people who didn’t conform to society’s rules as well. In this way humans may have eliminated many people with larger brains that just couldn’t fit in. One study of a primitive society in New Guinea showed that as much as 10% of the males were executed because they couldn’t follow society’s rules. The death penalty selects for tamer humans by eliminating aggressive individuals from the gene pool. The death penalty was also common in western societies until the 20th century. Aggressive intelligent humans had a big advantage over tame humans when the world was a wild place. But some of the characteristics that favored survival in a wilderness are counterproductive in a civilization dependent upon the rule of law to prevent chaos. Human cranial capacity is on the increase again. Over the past 200 years there has been a major improvement in the average human’s diet. Better nutrition is leading to larger cranial capacities. The brain is a large fatty organ that requires a great deal of energy. With a better food supply humans with large brains are more likely to survive. However, I believe this recent trend is temporary. I predict future generations will suffer from greater incidences of malnutrition as the world population outstrips the ability of farmers to produce enough food for everybody. You are currently browsing the GeorgiaBeforePeople blog archives for July, 2015.